Ronnie practiced what he preached - long live rock n' roll! 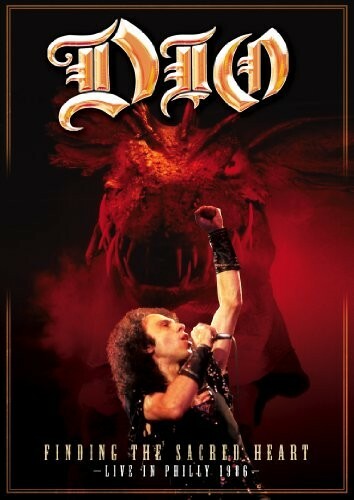 Incredibly, the night I put on this DVD turned out to be the third anniversary of the great Ronnie James Dio's passing. It's hard to believe he's gone, let alone been gone that long. Fortunately his music will live forever and this superb concert recorded in Philadelphia in 1986 on the 'Sacred Heart' tour is a worthy addition to any collection. Featuring the under-rated Craig Goldy on guitar, Ronnie comes flying out of the blocks with 'King Of Rock And Roll', backed by swirling keyboards of Claude Schnell and the pounding rhythm section of Jimmy Bain and Vinny Appice. Ronnie commands the stage, leading the band through 'Like The Beat Of A Heart' before unleashing 'Don't Talk To Strangers' from the classic 'Holy Diver' album. The more commercial 'Hungry For Heaven' sounds great as does the killer medley of 'The Last In Line/Children Of The Sea/Holy Diver'. Rainbow and Black Sabbath are included with 'Long Live Rock And Roll', 'Man On The Silver Mountain' and 'Heaven And Hell' but the emphasis here is very much on the Dio band. Dull solo spots aside, every moment here is killer, from 'Sacred Heart' itself to the high octane finale of 'Stand Up And Shout', 'Rainbow In The Dark' and 'We Rock'. Ronnie's voice is powerful and faultless from start to finish, which is more than can be said for the stage attire the band are wearing. This is quite obviously mid-eighties – the only thing bigger than the clunky animatronic dragon which Ronnie 'slays' is Craig Goldy's hair. There are laser graphics, flashbombs and Vinny Appice playing what appears to be about three kits, as he is literally surrounded by drums. It all looks a bit Spinal Tap now, but if you were around during that period, that may well add to the charm. The music is amazing and available to buy on CD or vinyl. If you want to enjoy the eighties concert experience all over again, you can have it on DVD or Blu-ray, resplendent with bonus interviews from Ronnie and Craig and a tour featurette. Regardless which version you buy, you'll enjoy it. Ronnie practiced what he preached – long live rock n' roll!